“Nova” is pretty, big hipped, and has good bone. She is bred to perform. Has the looks and style that we look for in a cutting horse. She is nominated to the Breeders Invitational. “Razzle” has been started on cattle and has worked a flag. Huge stopper and very athletic. She is a beautiful filly and is coming along nicely in training. “Tex" has what it takes to be an extremely versatile all around ranch horse. He is agile enough to work a cow, big enough to head or heel, and comfortable enough to ride out all day long. This mare is real broke and wants to do whatever you ask. Has a big stop and a big engine. She's been roped off of, worked cows and had a lot of miles on and off the ranch. “Billy” is broke and ready for a job. Make him a barrel horse, penner, or just a nice ranch horse. He opens and closes gates, does flying lead changes, moves cattle, and crosses water. He has a very sweet disposition and has nice size, good feet, and good bone. “Jack” is going very well under saddle. He is a big stopper, opens and closes gates, and goes through water without hesitation. Will make a nice cutter, reiner, cow horse, or a very nice ranch horse. His flying lead changes are so smooth you almost don’t see it. He has conformation, good looks, and a great mind. “Jewel" has been ranch ridden, started on cattle, and has a lot of miles on her. Her breeding speaks for itself. 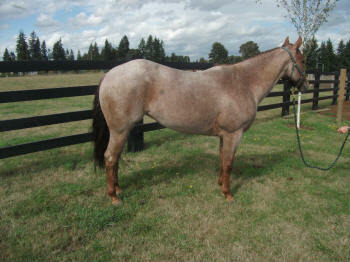 She has potential to make a reiner / working cow horse and is priced to sell.